‘The Dreadful story of Harriet and the Matches’ was written and illustrated in Germany 1845 by Heinrich Hoffman for his son. It is part of the children’s book collection called “Strewwelpeter” which uses gore and black humour to scare children into behaving well. When Harriet is left alone by her mother and nurse her ‘foolish’ disobedience in lighting a match leads to her death. The painting shows Harriet’s rebellion as she lights the match just like her mother ‘who so often does the same.’ Through mimicking her mother’s domestic actions (lighting a match to cook over a stove) Harriet shows an unconscious desire to grow up and copy a traditionally female household role. Poignantly, the desire kills her – she is distracted by the ‘pretty’ flames, which then catch light to her apron strings. 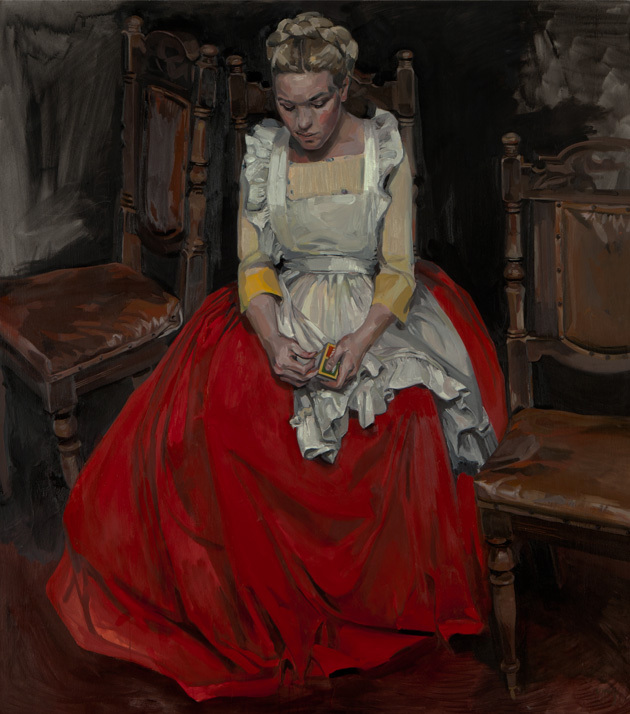 The red folds of her skirt remind us of fire and the empty chairs the absence of her mother and nurse. We question their responsibility and also the lack of a male presence, which is striking considering how the Strewwelpeter stories were written by a father for his son. The way that Harriet literally copies her mother illustrates children’s susceptibility to imagery, and to the actions of adults around them. The colours and outfit she wears recall a Paula Rego painting ‘Looking Out’, which questions similar female issues. It also reminds us of Hoffman’s own illustrations, which were one of the earliest examples of a successful collaboration between illustration and text, both contributing equally to the story to express something that cannot be expressed by words or pictures alone. Based on a Struwwlpeter story "The Dreadful Story About Harriet and the Matches" by Heinrich Hoffman - see text below image.